Eighty years after it first appeared in Greek literature, ‘Junkermann’ by M.Karagatsis is still considered one of the creative highlights of its time, one of the few times in the novel that undoubtedly the genre received complete justice in our country. If anything, it’s not common to come across a writer who takes full advantage of the novels possibilities (even in its conventional form), to expand time, people and places in such scale, to intertwine primal and secondary themes every way possible, to prove how a simple reading can become a journey into the outer and inner world of an era and a person. And all this to conclude in the end for the protagonist, in this case Junkermann, in something so concise which can be summarised in one or two phrases to describe the whole world, the simple and the unique, the best out of all the possibilities. Such a vast world,so many words and to end up with something that resembles a eulogy on a tombstone. I expect ‘Junkermann’ will be known to practically everyone who visits ‘Poreia Theatre’ (which celebrates its twenty creative years at Victoria Square). The reason it’s worth examining the theatrical adaptation of the novel by Karagatsis –being more accustomed to its adaptations for television, is because this time the novel is adapted by a poet and is staged by a director. And it really is worth it. Firstly because we all are familiar with the foreigner with the strange name who appeared in our adolescent and younger readings. Therefore, more as a legend and less as a character, Junkermann lives inside us since then and that is what we look out for at Poreia Theatre. Poetic form in dramatic structure. Luckily though, we search for Junkermann through the poet Stratis Paschalis and the feeling of director Dimitris Tarlow. In their own achievement of condensing one thousand two hundred pages into a theatrical text of no more than two hundred pages, and its shift from narrative form to theatrical dialogue, what drives the performance dramaturgically, is not so much the life of the main hero, as much as his last moments.In its presentation in Poreia Theatre, the life of the Finnish Odysseus is presented in reverse, when his journey has reached its end. And from the whole myth, similarly to what happens in pure-breed tragedies, we are left with that precious moment in time where fear and mercy coexist. From the whole novel, we are left with the final and tragic epigraph. So this is what occurs: all the power of the novel is condensedin one and only poetic flow and it all fits in a theatre and in small scale. 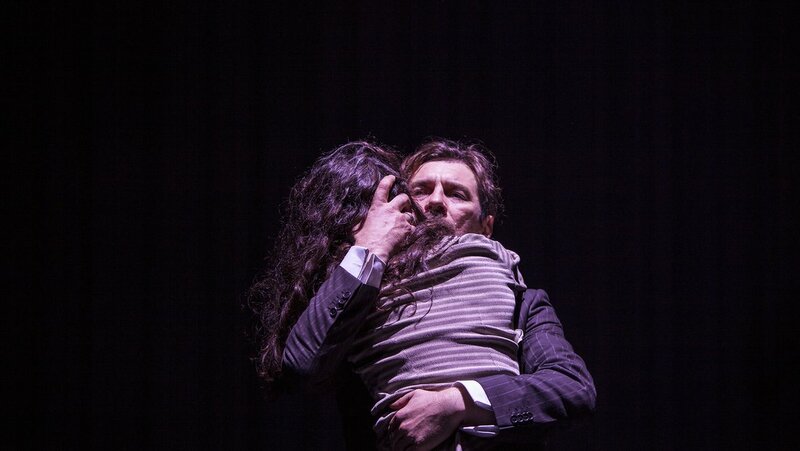 Yes, indeed, there is as much Strindberg in Poreia Theatre as there is Karagatsis. And if one excludes the scarce technical and poetic means of the performance: a walkway upstage which represents the course of life, trap doors which reveal the necessary props (set design by Elli Papageorgakopoulos and Dimitris Agelis), everything occurs on a dreamlike and expressionistic space, within fragments of memory, with the (very Strindbergesque) anxiety to at some stage surpass reality’s naturalism and from our own personal Hell, to reach the other side, the Dream. That is why Junkermann at ‘Poreia Theatre’ is not initially for those who want to ‘watch’ instead of read Karagatsi’s work. Of course, even this way the performance is interesting. The effort by the audience becomes even greater, as the gaps in the storyline (as is only natural) are significant and the continuity isnot always the same nor clear. In thisJunkermann, the climax occurs when we have personal connection/experience with the novel – and more so when our visit to ‘Poreia Theatre’ is not lead by intention to justify the novel, but by honest intent forits creative recall. So who is Junkermann at Poreia Theatre by Karagatsis, Stratis Paschalis and Dimitris Tarlow? Someone who is in search of his own light. He will discover at some point that he was nothing but a lens which reflected the light of others, at some point, early on in his journey, the light of a new homeland. He is still unaware that ‘Acclimatization under Phoebus’, is not only conquered by the light of life but also with the acceptance of its holy Darkness. The confirmation of the flesh, lust, supremacy or glory, do not lead to the meaning of life. It is deep knowledge which connects to the memory and which exists within us almost naturally. It’s ironic for those damned like Junkermann who spent their lives trying to find answers to the question of the world, only to realise in the end that the world answers only to the innocent. As it does to the humble and somatic Voula. The ‘only one in the world’ who carries her answers in her innocence. Gianni Stankoglou’s acting encompasses a huge journey, from the Clarke Gable type to ‘Peer Gynt’ to ‘Zorba’ and to Strindberg’s ‘Dreamplay’. His interpretation of Junkermann is important because first of all it’s theatrical. Once again Christos Malakis is outstanding as Michalis Karamanos who is the character-persona of Karagatsis. Zeta Makripoulia not only gains from the performance at ‘Poreia Theatre’ but also gives plenty in return, for example her theatricality in the role of the vamp and the film noir’s femme fatale… However, her brief interpretation of the dark mother is her best moment in the performance. On the other hand, drenched in light and the stout innocence of Karagatsis stands Thaleia Stamatelou’s Voula. Beyond that, there is the familiar characteristic of the theatre at Victoria Square. As always the secondary parts are all exceptional. Giannis Kapeleris, Polydoros Vogiatzis (exceptional Cleo), Dimitris Petropoulos and Giannis Dalianis (outstanding appearance), Danai Saridaki's fabulous Alkmini, fabulous Aspasia by Kaitie Manolidaki, Dimitris Bitos and the exceptional Servant by Nikos Kalamo. Close by are: Lida Maniatakou, Alkiviadis Magonas, Bilio Marneli, Corinna Kokalli, Andreas Natsios, Eleni Charastani and also the on stage musician Lena Chatzigrigoriou. The director’s son Filippos Tarlow ends the performance as little Junkermann as everything once started. Upon his entry the director meets himself in his theatre, as possibly the writer did question in his work who would this Karamanos be. Special mention to the costumes by Aggelos Mentis and Katerina Polemi’s imposing music. The novel by Karagatsis is adapted and becomes a theatre performance by a poet (Stratis Paschalis) and a director (Dimitris Tarlow). Everything takes place on an expressionistic almost Strinberg-like universe, amongst fragmented cries of memory. Outstanding performances and imposingmusic in a performance truly worthwhile.